The truth is that Wikipedia reveals what is normally hidden in an encyclopedia: the countless decisions that lie behind each entry. The only difference is that in Wikipedia, the decision-making never stops and the debates are often robust to say the least. [Encyclopædia Britannica] Editor-in-chief Dale Hoiberg is no less damning: "People write on things they're interested in, and so many subjects don't get covered; and news events get covered in great detail. The entry on Hurricane Frances is five times the length of that on Chinese art, and the entry on Coronation Street is twice as long as the article on Tony Blair." 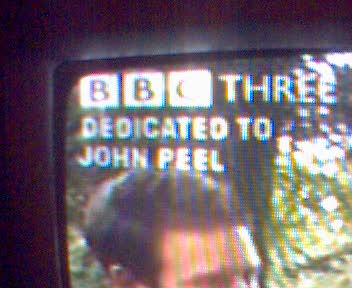 Other TV channels had their own tributes, opening lines for people to pay their respects. It seems that everybody in Britain is missing the loss of Peel, with the possible exception of Julie Burchill, who, some five years ago, did a Hitchens on him.